Educational institutions have unique characteristics that are unlike any other industry. They share qualities with both government and private enterprise, yet they're neither wholly one nor the other. That uniqueness extends to the needs of their print environment. For that reason, the independent research firm TechValidate went out looking for some firsthand data on educational institutions' experience with PrinterLogic. It reached out to several of them that had already implemented our print management solution. One case study (TVID: D08-151-768 ) is especially noteworthy—though it's certainly not the only one with impressive, far-reaching results. As part of and in addition to those downright stunning time- and resource-saving efficiencies, the same institution also succeeded in consolidating its server infrastructure, simplifying routine printer installation for its end users, and centralizing the management of its print queues, network printers, and drivers. The IT staff can also now deploy printers without the need for scripts and group policy objects (GPOs), and users have access to convenient, secure pull-printing features that weren't previously available. That was in a mid-sized print environment with between 250-500 networked printers, fewer than five print servers, and more than six physical locations. What's more, this educational institution fully installed PrinterLogic in a single day, so there was no delay in enjoying the benefits of our revolutionary print management solution. 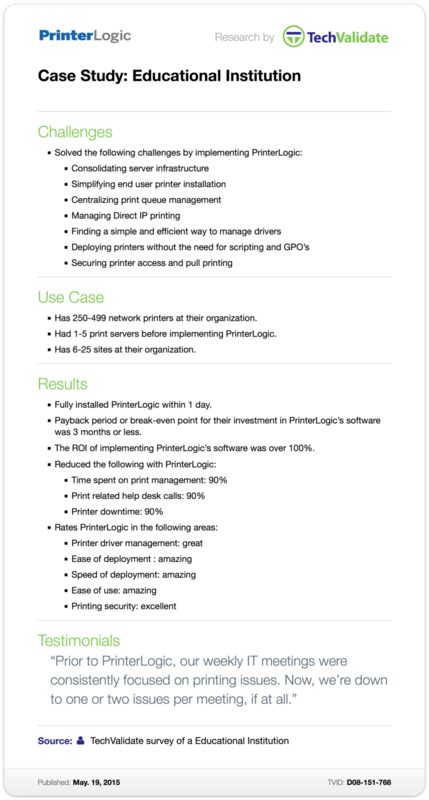 Small wonder that when it came to return on investment (ROI), the organization totally recouped the initial cost of PrinterLogic within less than 90 days. The ROI has continued to accrue ever since, thanks to those massive reductions in resources and giant gains in productivity. It awarded PrinterLogic a rating of "great" in the field of printer driver management, and "excellent" when asked about printing security. "Prior to PrinterLogic, our weekly IT meetings were consistently focused on printing issues," a representative for the institution said. "Now, we're down to one or two issues per meeting, if at all." It doesn't take an advanced degree to see that PrinterLogic's benefits extend far beyond the educational sector.